I’ve been using this ratty looking (tote) bag to store my Past, Present, Forever kit materials. Since it’s a one compartment bag, I have had to constantly dig through the bag to get what I wanted. I would say the bag itself is a decent size. As you can see though, there’s not quite enough space for the charts and aida cloth. To be fair, I probably would have an easier time finding things if I cleared out the items that I didn’t need. I kept some of the smaller items stored in what was left of the original plastic casing of the Past, Present, Forever kit. I haven’t removed the extra markers and colored pencils because I didn’t know which was the best to use to highlight the boxes I completed for the charts. Thankfully, I can get rid of them now. 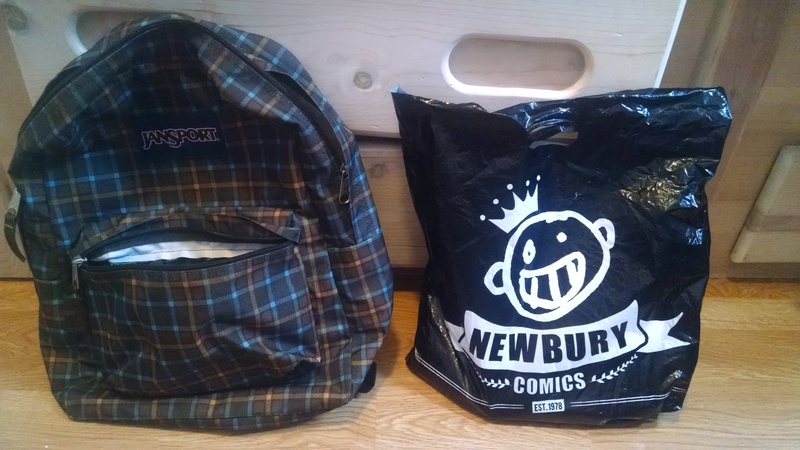 For the two other projects I’ve put off to the side, I use an old JanSport backpack and a plastic bag. These projects require a smaller amount of materials especially floss, so I don’t feel as tasked to change how I store them. Love, love, love JanSport backpacks! I always love their stitched in pencil/pen holders. I might put this bag to good use. 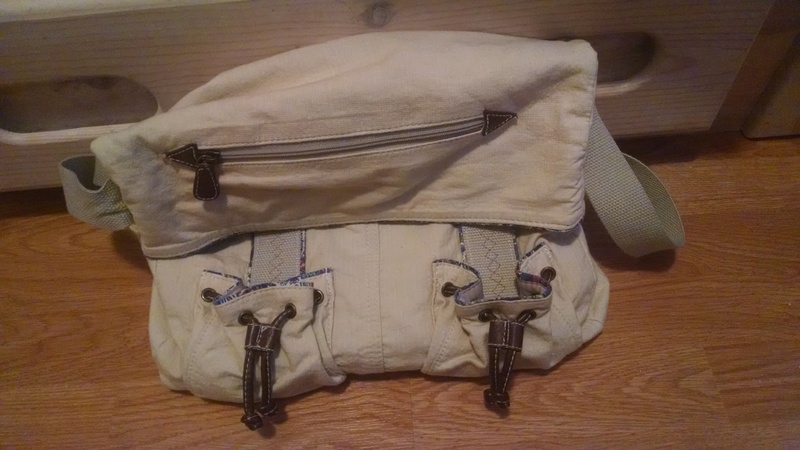 It seems like a good size for projects, and it has lots of pockets :). I’ll probably end up throwing the blue tote bag out and use this bag instead from now on. I’m considering getting a DMC StitchBow travel bag after reading about it in flossandfibro/myknitsandpearls’ blog, but I can’t justify getting one with the bags I have shown above. The system I use isn’t “broken”, the travel bag would just “enhance” how I store things, and I don’t like the blue and yellow color combination (blegh!) on the bag sold on Amazon particularly! I can’t believe it’s been so long since I’ve had cut these strips to thread my needles :). What a throwback! I figure I had that random, old note card in the bag too to make more strips. 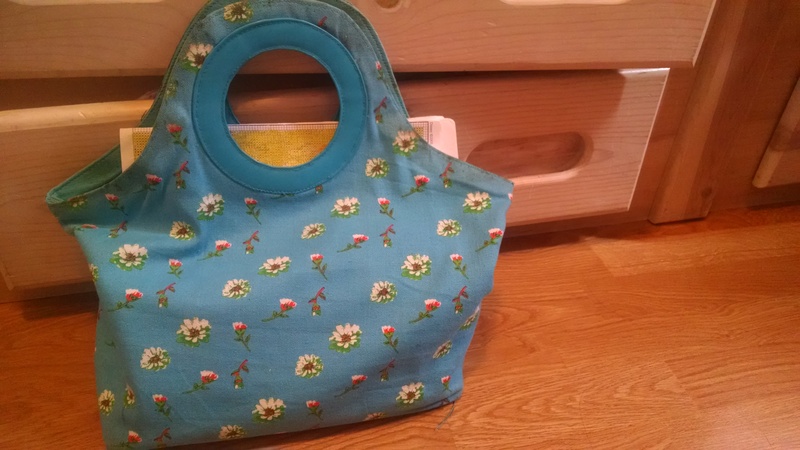 Fellow cross-stitchers of WordPress, how do you store your cross-stitch materials? For those of whom have used the StitchBow travel bag, would you recommend it? flossandfibro (or myknitsnpearls) here again! 🙂 You’re welcome for the tips, and thank YOU for reading my blog and linking back to it! I should do a new post on my new blog (http://flossandfibro.wordpress.com) on the new way I’ve found to organize my WIPs. It’s not exactly space saving, but it has worked out SO well for me, and I’ve found it’s pretty decent for traveling with my WIPs too, for short distances at least. I think I will do that soon! I’ve shut down my old blog (it’s still there but I’m not posting to it anymore), but my new blog is not only about my struggle with my chronic illnesses (fibromyalgia and arthritis in my back/degenerative disc disease), but I also post a lot about my knitting, cross stitch, and other hobbies. 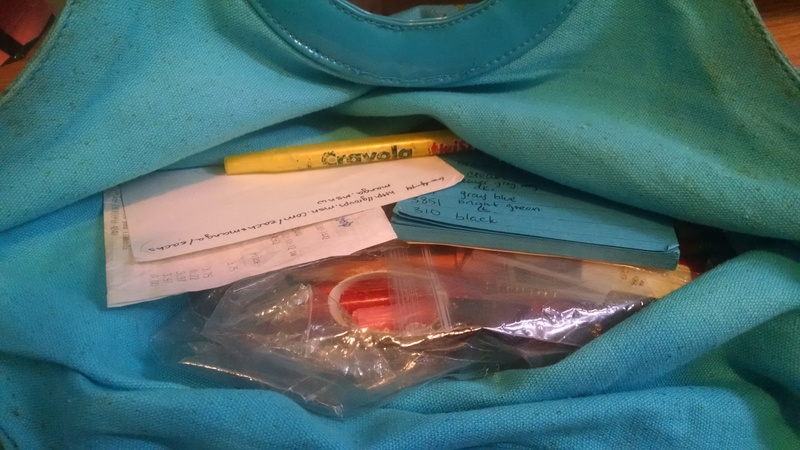 And an organization post would work well because with fibromyalgia it’s important to be organized, because I don’t have the energy to go searching for supplies for a project when I want to work on it. If you’re interested, join me over at my new blog and keep your eye out for it. I’ll try to get a new organization posted up in the next few days! Oh, and I’m subscribing to your blog! Always nice to meet a fellow stitching blogger! Thanks for replying and subscribing! I will surely subscribe back to your new blog :). It’s inspiring that you keep up with so many crafts despite the illnesses. Rock on, girl! Thank you! My hope was, by starting my new blog focused around coping with chronic illnesses (including my fibromyalgia and arthritis, but definitely not limited to that, and including ALL chronic illnesses) that I would inspire and help and offer support to other people with chronic illnesses, to show them that there are ways to deal with their illnesses – like using crafts (knitting, crocheting, cross stitching, making jewelry, coloring and drawing, etc) as therapy. Thanks for the subscribe! I’m currently working on a Nora Corbett (Mirabilia) design that was free from the April 2016 issue of Just Cross Stitch magazine. She’s called “Queen Anne’s Lace” and she’s a beautiful, intricate fairy with tons of beads and some sparkle using Kreinik metallic thread. I’ve never worked on anything so intricate so it’s been a challenge but I’m loving every second of it. I also have about 20 other cross stitches in various stages of progress, so I should soon get on the ball and do a post showing off ALL my WIPs! Thank you again! I look forward to seeing your progress on all your WIPs, but especially your Past, Present, and Forever one! I love Disney cross stitches! Been subscribing to a lot of bloggers working on fairy designs and am glad to subscribe to another! I’ve never really seen fairy designs until I’ve gotten around the WordPress cross-stitch community and I can’t get over how lovely they are! Wow! 20ish cross-stitches? How do you keep track of them and/or decide which to pick up again? I use the StitchBows and love them. 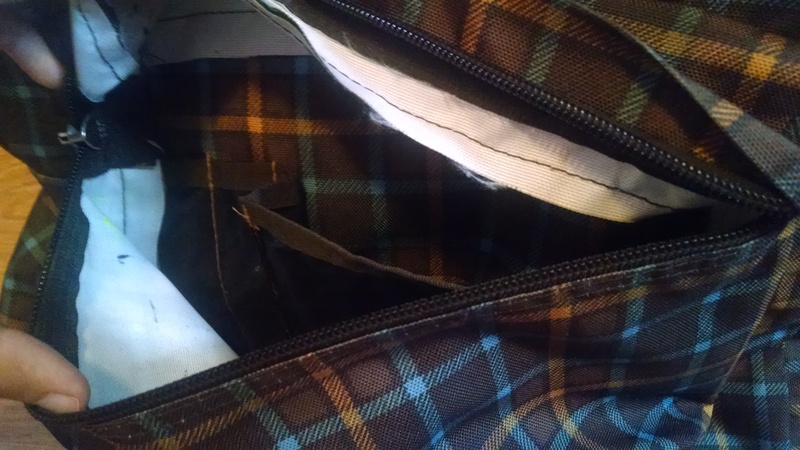 I haven’t used the travel bag yet, though I’d consider it (and have an old project bag of my mom’s that that the plastic sheets may fit in…); my projects recently have all been too big to travel. I use the binders both to store and to organize for projects. I love that I can store my floss on a bookshelf. The only downside to the StitchBows I’ve found yet is that they aren’t all that friendly to leftover lengths of floss, but I’ve managed to work that out reasonably well. When you say StitchBow, which product are you referring to specifically? The binders? 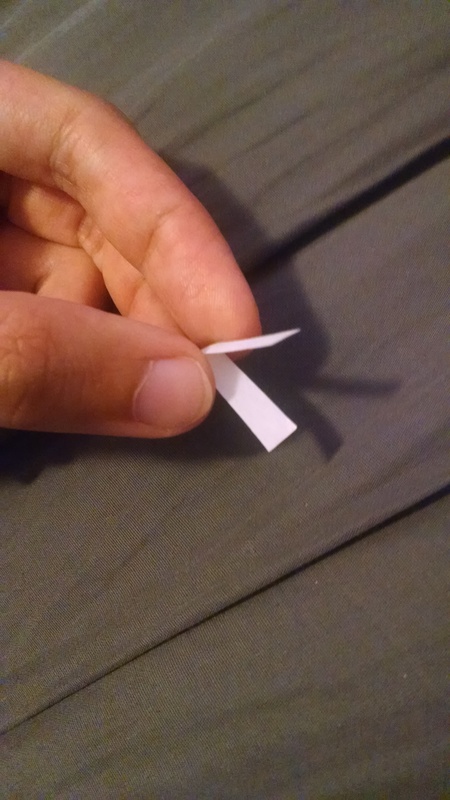 Specifically,a StitchBow is the little plastic thing that somewhat resembles a bow that the floss goes on. I use those, the clear sleeve sheets that hold them, and the binders. ah, I appreciate the explanation! I use bobbins & therefore the plastic boxes that hold them when not in use, or metal book rings to group per project (I don’t care if I have more than one bobbin per thread colour); but for each WIP I have a toilet bag. You can get them in a lot of different variants/fabrics and with pockets or dividers. Cheap too! If only because I was too cheap to switch to a stitchbow system! I am moving to plastic bobbins as card gets too battered on rings.